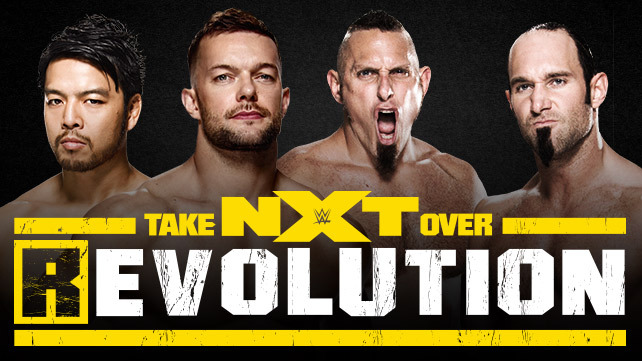 Check out amazing photos of Finn Bálor’s striking new appearance, which he debuted at NXT TakeOver: R Evolution on WWE Network. Kidd holds the ropes open for Natalya and offers to do the same for Breeze in a funny bit. Itami and Kidd get things going but it’s quickly off to Breeze, whose arm is quickly yanked. Balor comes in with a slingshot stomp for no count but Kidd makes a blind tag and decks Finn to take over as we go to a break. Back with Breeze coming in to stomp Finn in the corner before it’s quickly back to Kidd for even faster stomping. A neckbreaker gets two for Tyson and we hit a bow and arrow. Balor fights up but misses a dropkick to put him right back down. Breeze grabs a neckbreaker of his own for two before Kidd comes back in for a hard kick to the leg. A slingshot legdrop to the back of the head gets two for Kidd but he eats a Pele (now called a soccer kick), allowing Finn to tag Hideo. Itami fires off a series of kicks to destroy Breeze before hitting a delayed running dropkick in the corner to a sitting Tyler. Everything breaks down and Balor hits Shadows Over Hell, setting up Itami’s kick to the back of the head for the pin. Post match Finn tells Ascension to bring everything they have because he’s going to show them something they’ve never seen before. Finn Balor is asked about his match and he says that he is here to make a big impact. Finn says that the future is now. He is asked about Tyson’s comments from last week. Finn says that he hopes Tyson sends his uncle a copy of this match. Kidd with a waist lock but Balor with a standing switch. Kidd with a hammer lock but Balor with a waist lock and Kidd gets to the ropes. They lock up and Balor with a wrist lock but Kidd with a reversal. Balor with a reversal and hip lock into an arm bar. Kidd with a knee and side head lock take down. Kidd gets to his feet and Kidd with a kick and snap mare followed by another reverse chin lock. Balor with a drop kick and Kidd goes to the floor to regroup. Balor sets for a dive to the floor but Kidd hides behind Natalya and Balor stops before going airborne. We are back and Kidd misses a charge into the corner and Balor with an enzuigiri. Balor tries for a springboard move but Kidd with a drop kick that sends Balor to the floor. Kidd goes to the floor and he hits a neck breaker on the floor. Kidd picks up Balor and sends him back into the ring. Kidd gets a near fall. Kidd with an elbow to the bridge of the nose and then he connects with forearms in the corner. The referee has to pull Kidd out of the corner. Kidd chokes Balor and then he slingshots Balor’s throat into the bottom turnbuckle. Kidd gets a near fall. Kidd with a reverse chin lock. Balor with forearms but Kidd with a back heel kick. Kidd with a hard Irish whip to Balor. Kidd puts Balor in the Tree of Woe. Kidd with knees to the midsection and Kidd tells Natalya he wanted her to choke Balor but since she does not, he shows her what he wanted her to do. Kidd with a hesitation drop kick for a near fall. Kidd gets a near fall. Kidd and Natalya have some words before Kidd returns to Balor. Kidd with a snap mare and kick to the back for a near fall. Kidd with a reverse chin lock. Kidd asks the referee to asks Balor in Irish. Balor gets to his feet and Balor with a forearm. Kidd with a kick and he tries for a suplex but Balor lands on his feet and Balor with a chop. Balor with a running chop into the corner. Balor with an Irish whip and a running chop into the corner. Kidd misses a kick and Balor with a Pele Kick and a twisting brainbuster for a near fall. Balor waits for Kidd to get up and he charges into a boot. Kidd goes to the turnbuckles but Balor with an enzuigiri that knocks Kidd to the mat. Balor goes up top and he tries for the double stomp but Kidd moves. Kidd tries fr the Sharpshooter but Balor kicks him away. Balor charges into the corner but Kidd with a drop toe hold that sends Balor into the turnbuckles. Kidd with a slingshot leg drop to the apron for a near fall. Kidd goes to the apron and he tries fr the springboard elbow drop but Balor gets his knees up. Balor with a running kick to the head and then Balor goes up top, but Konnor and Viktor come to the ring and they attack Balor and the referee calls for the bell. After the match, the assault continues but Hideo Itami makes his way to the ring to help Balor. They square off in the ring until officials and other wrestlers make their way to the ring.